Originally published April 20, 2006, at GJSentinel.com. My interest in model kits was sparked somewhere around age 7; my interest in dinosaurs predates that by at least a couple of years. These two fascinations have risen and fallen with me over the years, but neither has ever faded completely away. So, when I found out recently about Cliff Green, a sculptor whose works include small dinosaur sculptures he sells as kits, working practically in the neighborhood, I had to get in touch to find out more. Cliff loves prehistoric animals and for the last seven years has made a living as a professional sculptor specializing in prehistoric fauna. He recently worked on a full-sized Dilophosaurus wetherilli bronze monument for the St. George Dinosaur Discovery Site at Johnson Farm and hopes to start a full-sized Brontotherium hatcheri bronze monument for Badlands National Park in South Dakota soon. 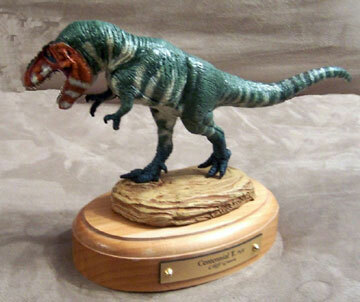 For “self-therapy”, Cliff also sculpts, casts and sells 1/35th scale prehistoric animals, including the T-rex pictured above. I was glad Cliff suggested focusing on this in my blog, because the T-rex has long been the dino that most fascinated me (probably because I thought he was the toughest). Cliff describes this sculpture as being rendered under the direction of some of the top Tyrannosaur experts of the 21st century, during the June 2005“100 years of T-Rex Symposium” in Hill City, S.D. The anatomy, pose and skin are based on the experts’ critiques. Cliff works out of the garage and front room at his home but hopes to buy a studio when the Brontotherium commission in South Dakota comes in, “hopefully very soon.” In the meantime, he says people are welcome to visit him at his address but need to call at least a day ahead of time “so I can hide the bodies.” If you’re interested, give him a ring at (435) 636-0887 or send him an e-mail at dinonaut@emerytelcom.net; I’ll leave it to him to share the actual address. He can also send you a price list if you contact him through e-mail. For fellow garage-kit enthusiasts, it’s also worth mentioning that Cliff’s brother, John, ran John Green Models for 25 years. That operation closed up shop within the last couple of years and is remembered fondly by longtime hobbyists. Me: Can you point to anything as inspiring your interest in prehistoric animals? Cliff: I have been interested in animals, prehistoric and otherwise, for as long as I can remember. Some of my earliest childhood memories are of looking at my grandparents’ old encyclopedia, and marveling at the photos of Charles R. Knight’s Chicago Field Museum murals. My older brother and I would recreate the murals in clay and display them, sometimes for months. Of course, I loved the old Aurora Prehistoric Scenes model kits. I was one of those kids that was absolutely obsessed with dinosaurs. Unlike most children, I never outgrew that passion. Me: What sustains this interest for you now? Cliff: Sculpting prehistoric animals for museums, parks, and occasionally the film industry is extremely rewarding to me. I am far from wealthy, but I have been able to support my family as a full-time professional sculptor for seven years now. There is nothing better than being your own boss and making a living doing something you love. The downside is that sometimes the commissions dry up, or clients are slow to pay, or have financial boondoggles. It is always a feast-or-famine lifestyle. Me: Which came first for you, an interest in dinosaurs or living in Utah? Cliff: Definitely prehistoric animals are my primary interest. I am not originally from Utah. I was born and raised in Southern California, and most of my family still lives there. I moved up to Utah in the early ’90s, looking for work, after I graduated from college in Phoenix. I met my wife 10 years ago in northern Utah, while working construction of all things. We have been married 10 years now, and moved here to Price five years ago. Price has a lot of bang for the buck, when it comes to paleontology, affordable homes, and a less hectic lifestyle. Having grown up in giant overcrowded cities, this town is a nice change of pace. I don’t know if we are putting permanent roots down here, but Price works for us right now. Me: Do you have a favorite dinosaur? Cliff: Horned dinosaurs are my favorite dinosaurs as a group, but if I had to pick one favorite dinosaur specifically, it would have to be the Utah state fossil, Allosaurus fragilis. It is a really cool-looking carnivorous dinosaur. This article was posted in 2006 archive, Prehistoric, Producers, Sculptors and tagged Cliff Green Studio. Bookmark the permalink. Follow comments with the RSS feed for this post. Both comments and trackbacks are closed.